Air Video Server HD 2.0.1 is available. Installed and using. So far no issues! iOS 8 + Apple TV 6.2.
it keeps saying i have missing codecs. i re-installed vlc player but the problem exists. Did you install 64 or 32 bit version? In that case this version should work. I have a PC running Windows 7 SP1 (64-bit version) and have installed the latest VLC Media Player 2.1.5 (32-bit version) and am using Air Video Server HD with an iPhone 6 on iOS 8.02. My question is which is my best option for ensuring maximum video codec compatibility with Air Video Server HD 2.01 (or even 1.0.15)? Should I use the 32-bit or 64-bit version of AVS HD and would I be better off with the 32-bit or 64-bit version of VLC Media Player. Thanks! "404! The requested file is not available on our mirrors"
Looks like VLC has problem with some mirrors. Does this work? i uninstall my VLC player (which is also vision 2.1.5) and install this one. 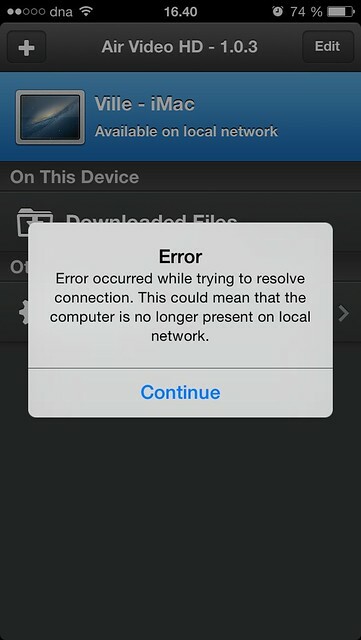 After this AVHD Server update (2.0.1) im getting this problem with my ipad/iphone. This server update fixes the subtitle (soft subtitles) problem with Apple TV3 with firmware 7.0. Though the subtitles work also with the older server version with "Allways use hard-subtitles" setting turned on.. Both devices (iphone5/ipad air) running ios 8.0.2. Mac is running with 10.9.5 mavericks. Also the Time Capsule is with latest firmware. And is it possible to adjust the subtitles ? I mean subtitles have now black background slightly transparent. I want that background off. With hard-subtitle setting on,theres no black background. So, when maybe comes the fix to this and when comes update to ios-app ? Latest I think came about year ago. Subtitle size will be adjustable as soon as the update gets approved. As for the server being unresponsive, does it make any difference when you enable and disable Airplane mode on the device? If I put the Airplane mode on, it says "Possibly available over internet". Then put the setting On, same thing. Works or doesnt work. I dont know,why it doesnt work all the time. EDIT : In settings,the connection speed test says "Latency: 25ms , Throughput: 53 927 Kbps" . Same with iPad "Latency: 13ms , Throughput 55 228 Kbps" . ME87, that actually looks like Bonjour issue. What kind of router do you have? Do you have any 3rd party firewall or other security software installed? btw. Air Video Server HD 2.0.2 has been released. (still not being pushed by automatic updates). I have the Airport time capsule 3tb ME182. With original settings. No 3rd party softwares. Ive downloaded the 2.0.2 update,let see if it helps. Now with the Server 2.0.2 and iOS software 2.0 works fine. No problems at all and 2.0 version looks great !